Finally! Predictive Analytics even I can use! When I was running marketing operations, I had hired a statistics expert to come into the organization to help me make sense of all of our marketing data. As I worked with this excellent “stats guy”, I realized that predictive analytics can be pretty darn complicated and required a more specialized skill set than I had originally thought. This all changed on Tuesday June 11, 2013. 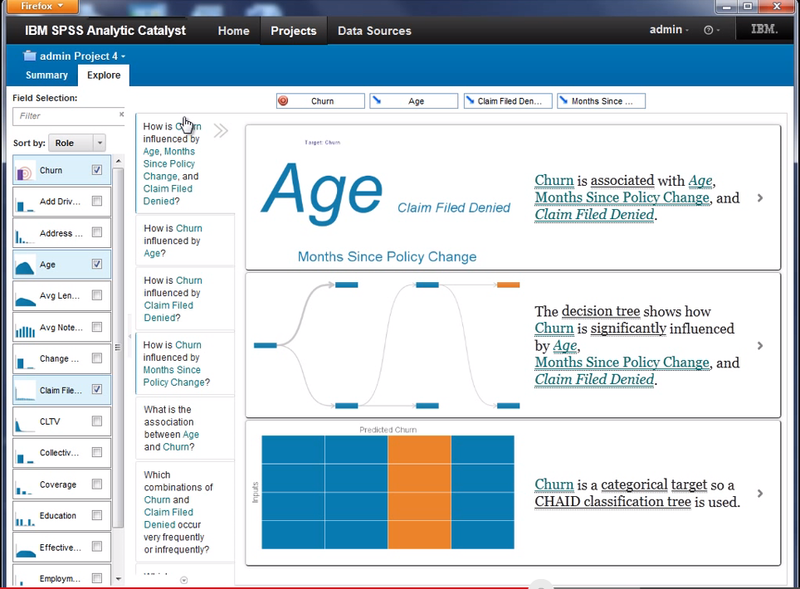 IBM announced the availability of IBM SPSS Analytic Catalyst – a statistician in the software – which makes predictive analytics on big data available to mere mortals like myself. I was admittedly skeptical that this new offering could actual make predictive analytics accessible. There had to be some gotcha…. well, I was wrong (not something I admit often!). So, what does this thing do exactly? Let’s say you are a marketer and want to understand which customers would likely “churn” or leave for your competitor. This is where Analytic Catalyst comes in. There is a three step process to get the answers you need. Sounds simple? Well it is. Review a demo here to see how this can help marketers, customer service teams, sales and other organizations find the small data within the big data!